One day, someone will write the history of the quotation mark, and it will be fascinating. This is not one of my pithier or more heaven-rending prophecies – not least, in part, because it has already been done – and you’d be forgiven for thinking that it’s the kind of tedious historical blether that stirs the loins of a dusty community of vellum-fetishists. In fact, the quotation mark signals key issues about what writing is for, what it’s supposed to achieve, and what its relation to truth is. I’m writing this in the wake of the furore that’s blown up around Johann Hari’s misuse of quotations in his interviews of various intellectuals, and the range of posturing about journalistic ethics and propriety that followed. I’ll have something to say about that, but it is worth bearing in mind that the initial complaint against Hari was around the specifically political and propagandistic uses of quotation in his interview (‘intellectual portrait’?) 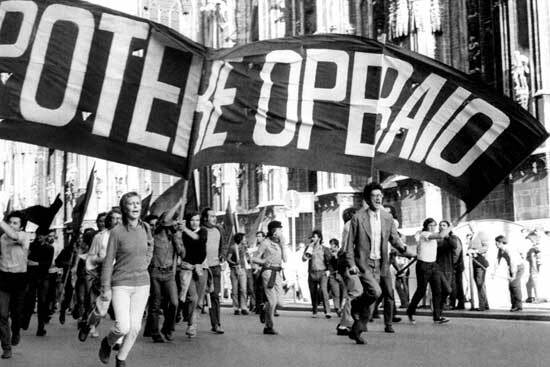 of Antonio Negri, rather than the ethical function of journalism per se. It strikes me, however, that this is also a question about the uses of the fragment, or the quotation, and what it’s supposed to do, and to approach it from that angle might relieve us of some of the moral bluster obscuring the issue. 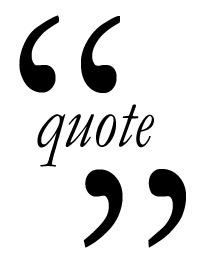 The standard assumption for any contemporary reader is that a phrase bracketed in quotation marks bears a greater fidelity to some prior speech act than other segments of prose – that is, it is directly taken from either speech or writing, and can be specifically tied to that author or speaker in that context, and a range of readerly assumptions about its usefulness (as illustration, as evidence) may proceed from that. But this only really holds true from the end of the eighteenth century; their function as guarantors of accurate transcription and representation is only a feature of the past two hundred years. 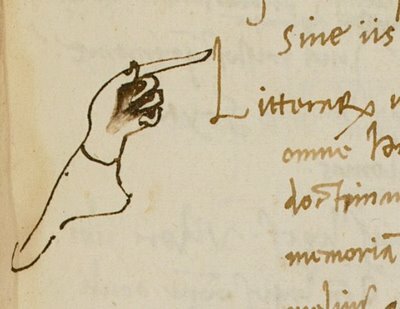 Prior to that point, the quotation mark was a marginal device, used largely by annotators of text (manuscript or print) interchangeably with pointing hands, to indicate a saying with authority, highlighting the consensually-agreed truth of a phrase. Generally, these would point to classical or patristic wisdom, and they facilitated the lifting of these phrases into commonplace notebooks, or florilegia, gatherings of useful verbal bouquets. A key point to underline here is the minimal weight put on the precise verbal accuracy of these sayings or ascription to correct sources, instead it is their moral, rhetorical or pedagogical weight that is most crucial. That such a use of quotation seems strange to us bears witness to a striking change in approaches to the totality of the discursive field, what we might call the commons of language, that with the rise of the printing industry, copyright and literary editorial practice (which may fairly be said to have begun with Pope) we also see the rise of what we understand as quotation today, that is, the apportioning of particular parts of language into owned tracts (‘enclosure’ would probably be pushing it) that must be treated in a particular way. The delineation of this history is not to lament the change, but simply to mark a change in the culture of language and what it does, the virtues of either model being far from complete. Where does this leave us with Johann Hari? As I mentioned above, it’s imperative to remember that the piece that sparked off the current debate wasn’t simply framed about whether it’s ethical or not to paraphrase poorly-made spoken points by lifting text from more eloquent published works, but about the reframing of those works to bolster a thesis about the interviewee or his work. There are, of course, a number of issues here: an interview is not simply an encounter with ideas, but with a meeting at a specific point in time, with all its attendant contingencies; the possibility that an intellectual may change his ideas over time, or refine them in speech, aware that an interview and a book are hardly the same thing; the unarticulated assumption that writing takes primacy over spoken expression. These are partly questions of literary aesthetics, but they are also questions with a political dimension, which cede greater and greater power to the interviewer over the meaning of his subject; yet the issue here is not simply about transcription, or about appropriate substitution, but about the way in which quotation functions to make an ideological point. Hari has defended his interviews as ‘intellectual portraits’, with the implicit suggestion that they sit halfway between the record of an encounter and a piece grappling with the implications of an individual’s thought. Both are laudable aims, but hybridity can produce monsters, in this case a piece faithful neither to ideas nor the encounter, but a cartoonish jab in the dark. Were this all it is, it would merit little attention, but to my mind what distinguishes the Negri piece from the others is that it moves from mildly mendacious sleight-of-hand to the land of the hatchet-job; in this, it illustrates why it is an issue to be taken seriously, because the ‘virtuous’ use of substitution (clarification, comprehension) can slip quickly into a muddying of the waters around extremely serious issues. It’s obvious that Johann entered into his interview with a dislike for his subject, confessing his incomprehension at Empire and his disbelief in revolutionary Marxism of any stripe. Contrary to the beliefs of many on my side of the political fence, this in itself is not a crime, though I confess some scepticism over his bafflement by Empire, which, despite its occasional infelicities, is not a hard text to grasp – and the ‘random’ selection of an excerpt from it looks rather calculated indeed. The piece recites the allegations against Negri, then concedes that he was jailed for rather more nebulous charges, but sticks hard on the question of what criminal acts the philosopher committed. Instead of telling us what Negri did say in response to this accusation, he lifts the answer –which does contain a denial of murder – straight from Dufourmantelle’s Negri on Negri. It seems an odd thing to do with an issue of this magnitude. But beyond oddness, it strikes me that there’s a deliberate rhetorical strategy in operation throughout the piece, of which the placing of lifted quotations is a major part. First, there’s how they’re framed – a panoply of invented or imported gnomic pauses, with cigarette smoke hanging in the air, spliced into the middle of the lifted quotations, presumably to give some ‘colour’ to the piece, but nevertheless refracturing prose that was once whole on the page. These have an obvious interpretive effect: if Negri is pausing here, why is he pausing? Is he concealing something? Is he obstreporous or fraudulent? Having left the issue of Negri’s criminality unresolved, but hovering around in an odd paraliptic gesture, Hari eventually moves on to the issue of memory and truth. Others have commented on the rather base irony of using lines in which Negri is discussing his opposition to the USSR to suggest he refuses to face up to its bloodsoaked historical reality, but the placement of this quote strikes me as a well-positioned conclusion to a running thesis about Negri’s refusal to offer justifications for criminality in 70’s Italy. I don’t doubt that Hari liked these lines from Dufourmantelle precisely because they’re immensely useful in advocating the line that he takes when discussing 20th century continental philosophy (‘postmodernism’ as he hazily calls it) – which is that it’s prevaricating, irrational charlatanry and indeed dangerous to a pursuit of truth. Hari is a veteran in the tired rehash of the philosophical culture wars as a staunch defender of enlightenment values, so one can imagine Negri’s (to my mind rather beautiful) lines getting to him. But this isn’t simply an issue about whether one would champion Heidegger over Quine, because this line about truth – deliberately taken from Dufourmantelle and placed in the interview – comes scant paragraphs after highlighting (again, with a lifted quotation) Negri’s refusal to engage with questions of criminality. There’s an obvious implication here, which is that communists of Negri’s kind don’t feel subject to their past acts; surely any reader might be forgiven for then looking sceptically at any protestation of innocence over the murder of Aldo Moro, or of bank robbery, and so on. So, here we return to the issue of quotation: that it directly ascribes a position to an individual, that it allows the writer using quotations to position them in suggestive parataxis while distancing himself from the conclusions that they imply; in this case it is all the worse because the lifted quotations are taken out of a much longer, nuanced text and substituted as lines shorn of context, apparently given in conversation, and thus as bald fact. I don’t know if Johann meant his work to be so easily read as an extensive smear against Negri (I’d hope not) and I don’t think intent is necessarily exculpatory here – but I find it strange and dismaying that it’s an issue he hasn’t addressed in his apology. If this were a mere question about journalistic propriety, as many seem to think it is, then it would be of a lesser magnitude – over-hasty generalisation, moralising, rickety historical theses are all indelible faults of most comment journalism, largely because of its instantaneous, ephemeral nature. Schopenhauer: ‘Journalists are like dogs, when ever anything moves they begin to bark.’ But the extent and deliberation with which this piece marshalls its quotations as evidence seems worthy of highlighting, because it’s profoundly depressing, profoundly disappointing – and demands an answer. For this potted history of punctuation, I’m indebted to, inter alia, A.J. Minnis’ Medieval Theory of Authorship, Michel de Certeau’s The Practice of Everyday Life, and the work of Margreta de Grazia and C.J. Mitchell.